Hieroglyphic sealstones occupy an important footnote in the history of Aegean Bronze Age studies. Before the excavations at Knossos for which he is chiefly remembered, Sir Arthur Evans was prompted to visit Crete in search of an unknown writing system, which he had recognised on sealstones from the island. On his travels he increased the number of known examples and promptly published them (Evans 1894). A more considered account of the Cretan Hieroglyphic script, as he termed it, followed (Evans 1909). Yet Evans never completed the task which he set out on, that of decipherment, nor of the other two scripts he identified, Linear A and Linear B. Cretan Hieroglyphic and Linear A remain undeciphered despite comprehensive publication. The website under review marks a new stage in the Cretan Hieroglyphic story, with a fully searchable relational database of hieroglyphic sealstones. The Cretan Hieroglyphic database is one of two functioning databases at the centre of DataBases about Aegean Subjects, the other being a database of the Aegean collection of The National Archaeological Museum of Florence. 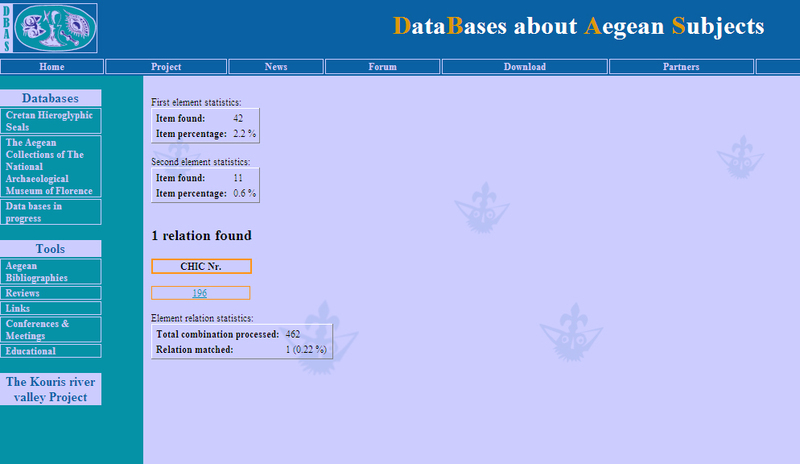 It should be noted that the 'Aegean' in DBAS and the latter database means 'Aegean prehistory', since there is very little mention of the Classical period onwards. This review will focus on these online databases, but in its initial publication (Jasink et al. 2006) and on the 'project' page (Fig. 1), much wider aims for the website are set out . A diagram [Link opens PDF] shows a number of linked databases spanning the Aegean: it appears to show a set of databases that are linked both internally and externally, with a forum for outside contributions. Despite the diagram appearing in the 2006 publication, the forum is not yet available, and nor are seven of the nine databases, except for three in the 'in progress' section; these have very limited datasets and are not fully functional (Fig. 2). On the project page, the architecture of the website is described as 'Linking of different data/sets', 'Linking of different databases', 'Linking to different web-sites'. Yet it is hard to see from what is currently available that this is more than a website hosting a number of research databases with a conventional 'links' page (in itself a highly useful project). Nor would there seem to be sufficient thematic connections between these databases to justify linking them; there are no hieroglyphic seals listed in the University of Florence collection, for example, and neither of these object databases relates to the essentially philological Ahhiyawa Question. The associated bibliographic database of hieroglyphic seals includes the appropriate corpus numbers for seals mentioned in each article but this has no specific links to the DBAS seal database, or to the (very recent) Corpus of Minoan and Mycenaean Seals website. Hence this is not quite the 'new kind of on-line consultation tool' promised on the project page, but this does not particularly matter since there are already excellent websites with a bibliographic database for Aegean Bronze Age studies and for news about Aegean Bronze Age studies in general. Rather than try to duplicate these with its own non-comprehensive general bibliographic database or conference pages, DBAS is arguably far better positioned to become an Aegean equivalent of ADS. The significant difference is that ADS also offers downloadable datasets and databases, as well as online databases. ADS does in fact have a small dataset related to an Early Bronze Age site on Amorgos, but this is only intended for data from UK researchers. At the moment DBAS is seemingly restricted to University of Florence projects, but there are few databases of Bronze Age Aegean material available, and these tend to be related to particular (multiperiod) projects (e.g. Pylos Regional Archaeological Project; Antikythera Survey Project). 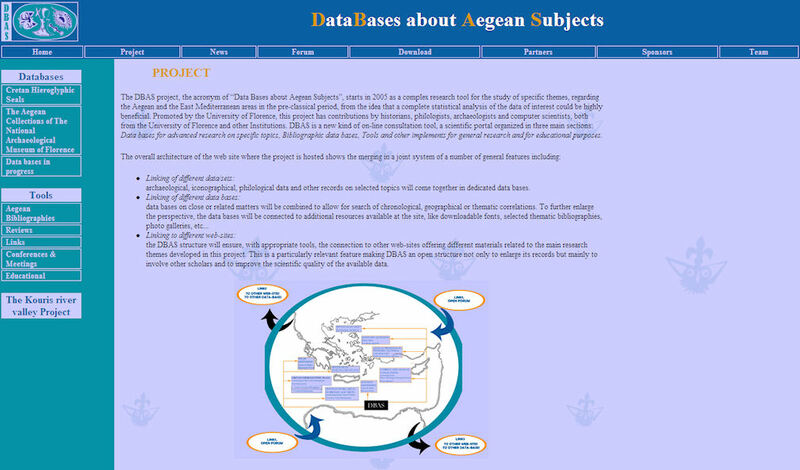 Given the volume of Aegean Bronze Age research, particularly PhD projects involving artefact databases, DBAS offers a clear lead on making such datasets fully available. Turning to the databases that are available, the Cretan Hieroglyphic Seals database offers a wide variety of queries, allowing the user to search by site or material, or to find combinations of signs on the same face of a seal or the occurrence of signs at particular sites. In this way it complements the Corpus Hieroglyphicarum Inscriptionum Cretae [CHIC] (Olivier and Godart 1996) perfectly, by allowing searches that would otherwise involve painstakingly working through the book (which is only to be found in specialist libraries in any case). Importantly for would-be decipherers, the book provides a larger sample because it also includes the signs written on clay documents, whereas DBAS includes only about 190 seals and sealings (clay documents preserving the impressions of seals). At the same time, the decision to include all the elements of the seal design rather than trying to isolate signs goes beyond CHIC because without deciphering the script it is impossible to know whether an element is decorative or modifies the meaning of the group of signs; even this distinction between signs and decoration is open to question. 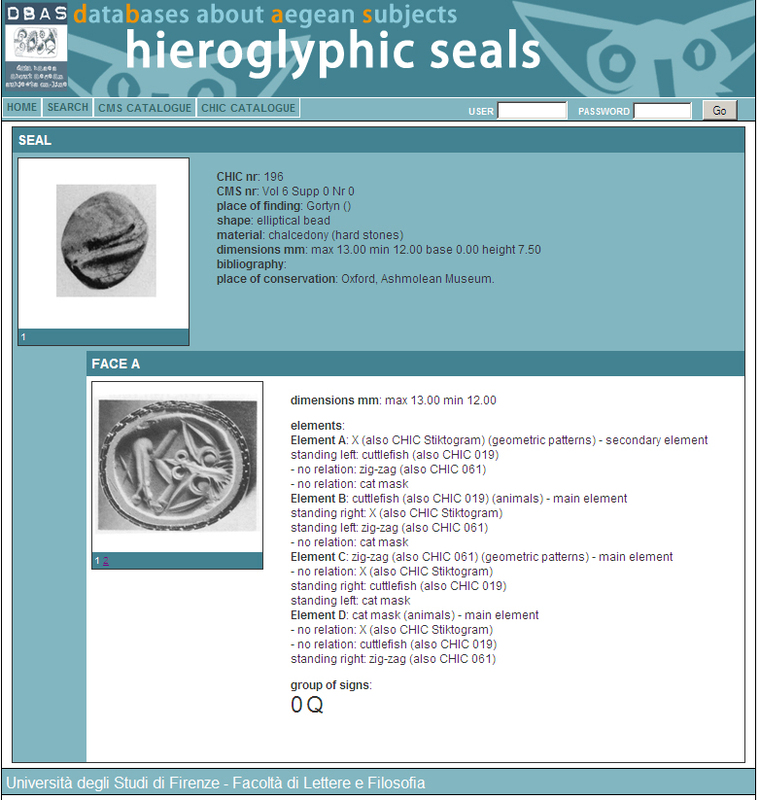 The database also incorporates images from the Corpus of Minoan and Mycenaean Seals [CMS]; although this has recently gone online, it does not offer the same powerful searches at the moment. Unlike DBAS, it is possible to browse by museum collection on the far more extensive CMS database, but this is not relevant to a statistical analysis of seal designs. Each DBAS search also results in a frequency statistic: it is already known that some sign groups (such as 'trowel' and 'eye') appear more frequently than others, and so this offers an easy means of quantification (Fig. 3). The combination statistic simply multiplies the number of occurrences of one sign by the other divided by the number of co-occurrences: this is slightly confusing because it doesn't take into account the number of sealstones in the sample. It would be useful to have overall statistics against which to compare the results of searches, such as number of seals in the database or total number of signs. An analysis of sign groups, and much else besides about Cretan Hieroglyphic, has been made freely available on the web by John Younger http://people.ku.edu/~jyounger/Hiero/index.html. Younger includes documents too, and is also more up to date because a number of finds have come to light since CHIC was published, notably from the site of Petras. The sealstones are not yet published but a few sealings are, and a glimpse of the seals is available on the Petras website. The advantage of the DBAS database is that it gives access to images of the impressions and seal faces: as a result these websites are complementary tools for the study of the script and the specifics of seal iconography. Whereas Younger offers analysis, DBAS records just have the raw data, often fairly indigestibly, since every single relationship is listed (Fig. 4). Yet the breakdown of the signs accompanied by a picture (and also drawing) of the impression is an invaluable way of reading these inscriptions because it is important not to divorce the signs entirely from their iconographic context. Combined with the exhaustive queries it allows, the database provides a new way to interrogate the corpus, and potentially highlight new patterns in the data. The other functioning database, The Aegean collection of The National Archaeological Museum of Florence, is part of a wider phenomenon of digitising museum collections. This is an invaluable aid to scholarship, since museum collections are frequently only partly published and finds from particular sites are often distributed throughout the world. The Internet has made it feasible to publish every last potsherd, with accompanying photos, revolutionising the way people can access museum collections. Currently every museum database is different, although there are efforts to harmonise publication of data to make comparison easier. Once again the Florence Museum database is hosted on a different website, which provides a slightly more attractive interface, although the same search options are available from the DBAS site with an English introduction. Compared to the seals database, the queries are somewhat restricted, meaning that it is difficult to search for particular objects, or even sites. Instead there are dropdown menus for geographic area, chronological period, material and typology. This is one of the drawbacks of online databases, which are more user-friendly than downloading the raw data but do not allow the user to generate their own queries. The dropdown lists and records are only available in Italian, although this could be seen as an opportunity to learn some new vocabulary (at least for me). The total number of records seems to be 614, most of which are pottery, Bronze Age in date, and evenly distributed around the Aegean. Searches bring up a single page with all of the relevant records in their entirety, which makes scanning or searching records easy but is quite overwhelming. Nearly every object has a link to a picture, either of the object or a group of objects containing it. Pictures are, of course, invaluable for any museum database since they complement the text record and allow the user to form their own opinion. The Internet has the potential to liberate traditional printed museum catalogues from the problems of cost and space in providing colour pictures for every object. In this case the database closely accompanies the print catalogue (Jasink and Bombadieri 2009): the sherds not considered suitable for this publication might have been usefully put online, and still could be. As a result of this paper publication, however, many of the objects have reconstruction drawings as well as photos. The main drawback is with the size of photos, which are mostly low resolution and under 150kb even when expanded. The quality is generally good, but only some of the objects have more than one view. They are perfectly adequate for accompanying the description, but (probably intentionally) not secondary use, or close scrutiny. Individual records provide most of the basic data expected, including detailed measurements and description of the fabric for pottery. The one frustration is the vague data about the findspot, which is only at the site level. In some cases this might be all that is known, but even the name of the excavator would narrow down the possibilities. An overview of the collection would be a useful addition to fill in some of this information, but this is only available in the printed version of the catalogue. This should not detract, however, from the usefulness of making this material widely available. A next step is to get these databases talking to each other: to take an example close to home, the British Museum Collections Online includes similar Bronze Age material, including a sizeable and comparable collection from Late Bronze Age Rhodes. It also includes material that should be in one of the other DBAS databases under construction, Mycenaeans and Amarnian Egypt. It will be interesting to see how these links are made when the data is added (currently it includes only four records). This is not currently entirely straightforward: the British Museum database also relies on a particular interface to retrieve records, but the proposed use of semantic web technology has the potential to make such data far more easy to share. It is perhaps only with the development of this technology that the stated aims of DBAS can be realised fully, with the efficient sharing of data between museum collections and comparison of various datasets. Yet it is important to recognise that the first step is making such data available on the web in the first place. Despite the frustrating links to unfinished projects that were announced five years ago, DBAS shows the way forward for a subject that is often hampered by unpublished data. After all, it was only after the death of Arthur Evans that the Linear B tablets from Knossos were properly published, allowing Michael Ventris to work with and decipher them. Although the Cretan Hieroglyphic sample is much smaller, the database is clearly a useful tool for continued attempts to do the same, particularly if it is kept updated with new finds. Although this is a minority pursuit, even among Aegean Bronze Age archaeologists, all should be encouraged to have a look at this site and consider making a database about an Aegean subject. Evans, A. 1894. 'Primitive pictographs and a Prae-Phoenician script, from Crete and the Peloponnese', Journal of Hellenic Studies 14, 270-372. Evans, A.J. 1909. Scripta Minoa, I. Oxford: Clarendon Press. Jasink, A., Baldi, M., Bombadieri, L., Carminati, F. and Gonzato, F. 2006. 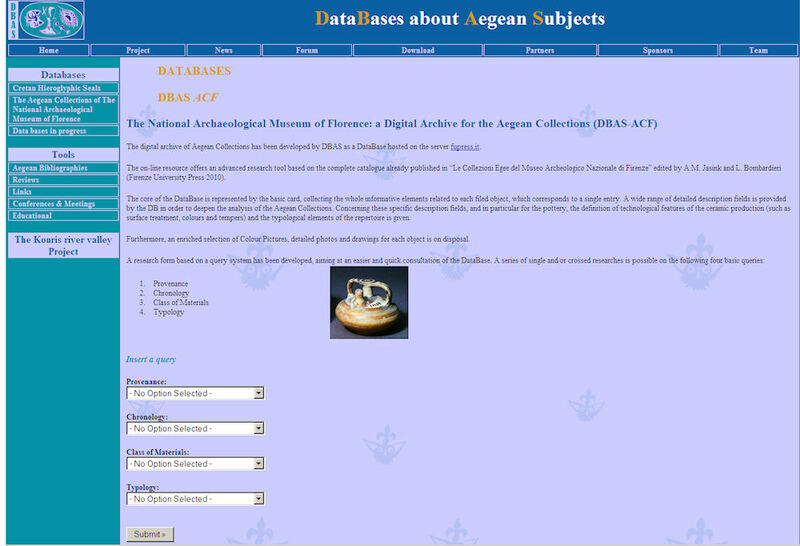 'Collecting databases about Aegean subjects on-line (DBAS Project)', Kadmos 45, 173-86. Jasink, A. and Bombadieri, L. 2009. Le collezioni egee del Museo Archeologico Nazionale di Firenze. Florence: Firenze University Press. Olivier, J.-P. and Godart, L. 1996. Corpus Hieroglyphicarum Inscriptionum Cretae. Études crétoises 31. Paris: École Française d'Athènes.